The 52-page report covers five case studies and explores the work of four innovative school districts in their transition to the modern, digital learning environment. 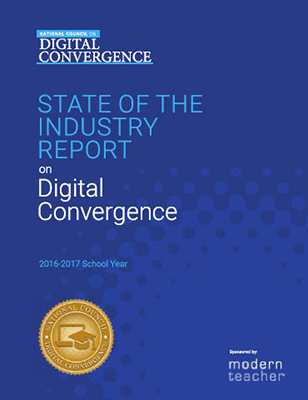 The report aims to serve as a resource for K–12 leaders, educators and other stakeholders beginning or already engaged in the work of digital convergence. The report is a “great shining example of school systems that are thinking about this strategically and creating systems alignment around convergence,” said Shawn Smith, president of Modern Teacher and an at-large member of the National Council on Digital Convergence. The school districts, he said in an interview, “are not thinking about a single point solution. Every decision impacts another one.” Smith said the primary objectives of the publication are to raise awareness of digital convergence; present context and a common language for convergence; and share best practices. Tracking and measuring against success indicators is vital to achieving optimal outcomes. The National Council on Digital Convergence was formed in June to raise awareness of the need for digital convergence, collect feedback from the field, determine and promote best practices and recognize and reward school districts that are progressing on the path toward digital convergence. Officers of the council include Chairman David Richards, superintendent of Fraser Public Schools in Fraser, MI; and Secretary J.R. Proctor, superintendent of Axtell Independent School District in Axtell, TX. For a full list of council members, click on this Modern Teacher site. To learn more about the national council or to request its new report, visit the Modern Teacher site. Visitors can also take a survey there to assess their school districts against the framework that has successfully guided other districts nationwide.